For the majority of modern society, the idea of cohabitation has become as sensible and necessary as test-driving a car before you buy it. The piece entitled 6 Signs It’s Too Soon to Move in Together, then elaborates on the various reasons that may indicate it’s not quite time to take the next step, including testing the relationship, pressure from one side to move, or using it as a Band-Aid for other problems. 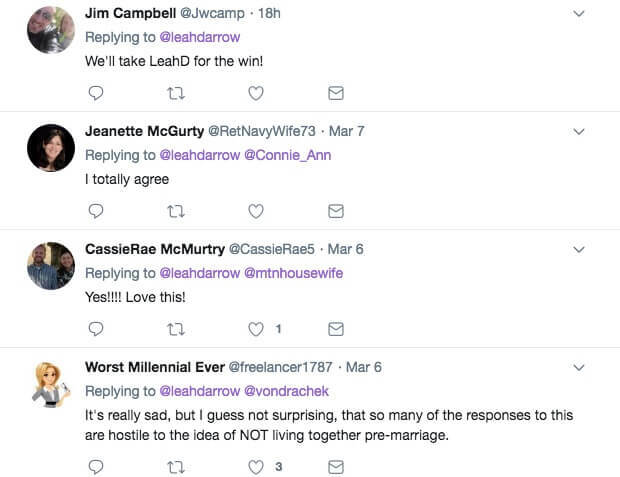 While many cheered on the seemingly practical 21st-century advice, Christian model and public speaker Leah Darrow called out the article with 6 signs of her own, inspired by a nugget of biblical wisdom. 1. He won’t marry you first. 2. He won’t marry you first. 3. 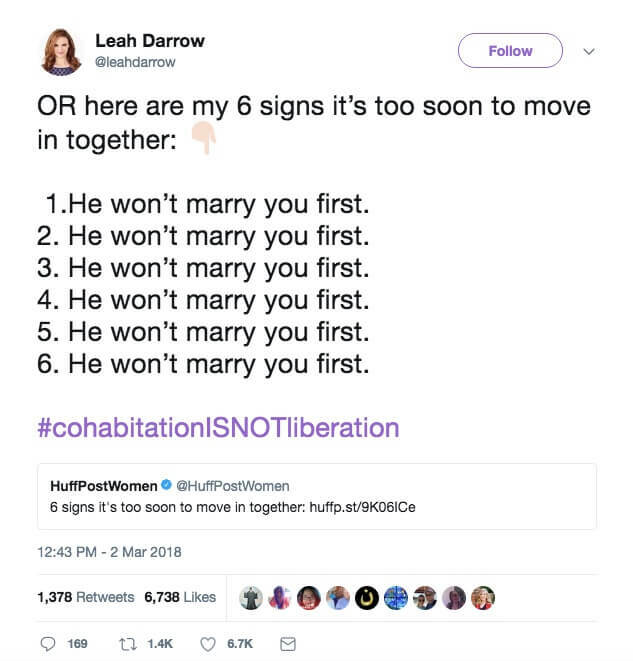 He won’t marry you first. 4. He won’t marry you first. 5. He won’t marry you first. 6. He won’t marry you first. While many people may mock these Christian values as outdated or senseless, ironically enough, research supports the idea that cohabitation does not lead to more successful long-term relationships. And while cohabitation is drastically on the rise, so is the divorce rate, which many researchers argue counters the common “test drive” myth. Amidst a society that devalues the institution of marriage, I’m thankful for bold souls like Darrow willing to go against the grain by speaking Truth to a generation that desperately needs it.